However, the circumstances surrounding Occhetto's historical intervention and the conflicts and upheavals that followed it testify to a crisis of identity from which the Italian left has yet to recover. The PCI, Western Europe's largest Communist party, had never been in government in Italy, except for a brief time in the immediate period of postwar reconstruction. As a party condemned to 'permanent opposition' by the continuity of DC-led coalitions, with American and Mafia support intent on keeping them out of power, they had nevertheless developed an impressive alternative political culture to political Catholicism. In the process they embraced more independent Communist solutions; from the moment postwar reconstruction began, Palmiro Togliatti, the party's legendary leader, favoured the construction of an open, democratic, mass party, as distinct from the traditional Leninist vanguard model elsewhere. He also pursued a strategy of structural reforms, whereby capitalism would be transformed by the extension of democracy to a range of social and economic institutions as a long-term strategy for socialism. This was an idea of a 'revolution as process' and much influenced by Antonio Gramsci's idea of a 'war of position', in which opposition movements seeking to take power needed to consolidate and broaden their political support through winning political consent gradually; in the process of winning consent, they would prefigure the nature of the alternative society. The PCI went a considerable distance in setting out an alternative 'Italian road to socialism'. At its height, under the innovative and charismatic leadership of Enrico Berlinguer (1972-84), the party developed an impressive mass base, including significant cultural sections, attracting in the process a range of prominent intellectuals and a reputation as the defender of Italian democracy (it helped write the postwar Italian constitution) and the initiator of broad alliances. Its 'Eurocommunist' identity was at its peak in the mid 1970s, when it received 34 percent of the vote in Italy, just behind the DC, coinciding with big turnouts for the French Communist Party (PCF) and the Spanish Communist Party (PCE). In addition, the PCI held control in a number of Italian regions and was developing a popular brand of municipal socialism. It even called its overall perspective the 'third way' to socialism, distinct from social democracy and Stalinism. Berlinguer's strategy of the 'Historic Compromise', devised from 1973 following his reflections on the fall of Allende in Chile, argued that the PCI had to make a compromise with the Christian Democrats, in order to consolidate its electoral gains. This compromise would entail withholding opposition to DC reforms in exchange for wider democratic changes. This strategy was ended abruptly and brutally by the kidnapping and assassination of Aldo Moro by the Red Brigades in 1978. The implications of Moro's assassination for the future of his country have been discussed in this book's introduction; it also had profound implications for the future of the left. Following the death of Moro, which benefited both extreme left critics of the PCI and right-wing conservatives in the DC, Berlinguer found it very difficult to construct a new strategy. Despite his increasing disillusionment with the Soviet system, which he described in 1981 as 'exhausted', his new 'democratic alternative' strategy adopted in 1980 did not win new supporters. The rise of Bettino Craxi as leader of the Socialists (which helped it become a centre-right that had connections to the later development of Forza Italia) brought a new electoral challenge to the PCI in the 1980s. The party's support declined gradually, suffering a major blow with the death of Berlinguer in 1984, until the events of 1989 precipitated its demise. ​However, the identity of the new party that would succeed it, notab|y its link to the past and its ideological objectives, was still a matter of contention. The conflicts and splits that persisted over the PCI's legacy and that of Togliatti and Berlinguer became open areas of debate. The PCI shared the wider crisis of the left in Europe, with particularly devastating consequences for a party of its size and mass influence. At one level of this debate was the split over whether the party should keep the word 'Communist' in its title and symbols. After all, argued Pietro Ingrao, leader of the PCI's left, the party had already moved a significant distance from the Soviet model; why did it need to renounce its past? The position of Occhetto and others, however, was that developments in Eastern Europe had hastened the end of the Communist identity and could no longer be ignored. Some, such as the riformisti, led by Giorgio Napolitano, went much further and argued that the new party should give up any historical opposition to capitalism and instead become a mainstream social democratic party. Others of a similar view launched an attack on Togliatti's heritage, even suggesting that his name be removed from the party's history. Occhetto's response to the 'historical revisionists' was to distinguish between a discontinuità (decisive break) and a demolizione (demolition) of the past. The task, he argued, was to move away from the idea that the party's subsequent strategy had to be justified in view of its historical role. In order to do this and to create a new identity after the decline of Communism, the party needed a new organisational and membership structure, one that would replace democratic centralism. Occhetto's announcement of this need to found a new non-Communist party at a meeting with partisans in Bolognina, before he had informed his party as a whole, confirmed that old-style Communist decision-making was still in evidence. In the lead-up to the final Congress at Rimini in 1991 that would decide the name and structure of the new organisation, various attempts were made to compromise in order to preserve aspects of the party's tradition, if not the name. Such was the confusion, sensitivity and caution in the internal debates that the new organisation was referred to as 'La Cosa' ('The Thing'). Previous allies of Berlinguer such as Tortorella were also concerned that the good aspects of the party's past were in danger of being jettisoned, and formed a link with Pietro Ingrao. The old party was effectively split two to one in the final vote. A minority led by Armando Cossuta broke away to establish Rifondazione comunista ('Communist Refoundation'). Cossutta in fact was a 'traditionalist' pro-Soviet Communist who had little support. Many of those in favour of preserving the PCI's heritage decided to remain with the new party so as to avoid further damaging splits. Moreover, these were not the only points of division. Some, such as the Napolitano riformisti, saw the need for the new party to prioritise its governmental objectives, resisting arguments to retain strong links with social movements. The latter had remained central to Occhetto's idea and had strong support from the Berlinguerians, who saw the party as widening their support amongst the left, rather than moving more towards the centre. In the event, the PCI became the PDS in February 1991, with a new symbol, the oak tree, replacing the hammer and sickle. One of the key reasons for the change was the view that new electoral opportunities would open up once the Communist label had been discarded and was no longer used in attacks by their opponents. Electorally, the PDS was in a very different position from the old PCI. It now had a more realistic chance of forming a government in contrast to the 'permanent opposition' the PCI had endured for virtually the whole of the last 50 years. Yet it felt it needed to dispense with much of its past, if it was to be a party of government. Ironically many of the Christian Democrats who had seen their governing party fall under Tangentopoli found themselves as allies in the new centre-left coalition, now termed Ulivo (Olive Tree). The left has two cores, one ideological and one governmental. In Italy, the first has been dominant. The nature of this left is such that it cannot govern; it is radical for its own sake. It is necessary to break with this radical left if one is to gain credibility as a governing force. Every temptation to indulge in the past must be resisted... Either we make it to government, or, frankly, we might as well join Marxist reading clubs, sit under posters of Che Guevara and sing Chilean songs from the 1970s. In place of ideology, Veltroni proposed what he called 'La Bella Politica', meaning 'high politics'; that is, a politics based on values, that was no longer corrupt or adversarial and that reclaimed its moral authority. Like his counterparts in Britain, he also conceived of the need for the left to claim its role as the party of the Internet and technological innovation; a need, as he saw it, to reposition the left away from its identity rooted in history. This revision for Veltroni was crucial to regaining trust amongst the electorate, while the rejection of ideology would facilitate the move towards a reconstruction of centre-left values. For Veltroni, a big admirer of John F. Kennedy, it was the American Democrats who were now to be the model party. Trust was dependent on new civic obligations, a new transparent approach to politics that would overcome political alienation between the political class and the voters. Combined with its historical revisionism, the PDS, like its European allies, put trust and modernisation of its image at the top of its agenda. This included streamlining the internal structure of the party, the use of spin doctors and soundbites and the packaging of the party leadership, including the marketing of the private affluence of party members from Occhetto to Massimo D'Alema (who had become party leader in 1994). This reflected the personalisation of politics that was apparent in most countries. D'AIema, taking a leaf out of Berlusconi's book, was pictured holidaying on his yacht. The PDS was also marked by a significant generational shift, bringing the 'quarantenni' , the 'fortysomethings', into the leadership for the first time - men (and like its predecessor, the PCI, its leadership remained almost completely male) like Veltroni and D'Alema. Given the extent of upheaval in Italian politics in the years immediately following its formation, the PDS wasted no opportunity to project itself as the modernised new force in Italian politics. It helped bring in electoral reform in 1993 that was intended to end political instability and reduce the number of political parties, working to the advantage of the PDS, the largest Italian left party. Its alliance with the progressive wing of Christian democracy in the Olive Tree coalition was further evidence of the change in Italy's politics, finally bringing some of the remnants of Communism and Christian democracy together. Though this was not enough to win it victory in 1994, when Berlusconi made his triumphant and extraordinary political debut, it promised a more serious project for the election of 1996. The defining component of modernisation that drove the DS-led Olive Tree towards its electoral success of that year was its commitment to liberal market reforms. This not only moved the DS to a similar terrain to New Labour, and a decisive political break from its leftwing past, but was also part of a broader critique of the historical defects of Italian capitalism that had stunted Italy's economic development. This included the oligarchic nature of Italian capitalism and to some degree follows a long preoccupation with the specific historical predicaments of the Italian economy originally noted by Antonio Gramsci, who wrote in the 1930s of the undeveloped nature of the Italian bourgeoisie. The emphasis on freeing up the market meant - as happened elsewhere in Europe - that the Olive Tree did not shift fundamentally from the neo-liberal hegemony prevalent in the West since the 1980s, though it helped, under the leadership of economics professor Romano Prodi, to ensure that Italy satisfied the criteria for entry into the euro at the end of the millennium. The 1996 government was therefore elected on a platform that emphasised trust, pragmatism and financial prudence. In the aftermath of Tangentopoli, there was a need to modernise Italy and create new confidence in Italy's public institutions. Ulivo's modernisation package included administrative reforms, devolution proposals, and changes to business laws to free up more 'flexible labour markets'. It was these kinds of reforms that, for Massimo D'Alema, held the key to the birth of a 'normal country'. The main focus for reform, though, concerned the economy, and Prodi's main achievement was guaranteeing the conditions for entry into the single European currency. If we've suffered from a defect in these years it has been our inability to link satisfactorily the single chapters of our reform programme to a general design, capable of involving the public, and of giving the perception of leading the country towards a better society of the future. There are a variety of different possible explanations for this timidity in putting forward a concrete reformist programme. The fact that there were various changes of leadership - three premiers in five years - indicates a lack of stability and much wrangling amongst the leading members of the coalition; this was most apparent perhaps when Massimo D'Alema replaced Prodi in 1998, by a typical piece of Machiavellian gymnastics, or in the attempts - ultimately to no avail - to keep Rifondazione comunista on board. The decision of the latter to leave the government over budget cuts was used by the centre-left as the main reason for the failure of the government and led to a split between the DS and Rifondazione that was to last into the period of the Berlusconi government. The most persuasive explanation, however, has to lie in the fact that as a country with strong ideological traditions whose movements and political parties were rooted in the historical memory of anti-Fascism, a banal and vacuous attempt to replicate the third way constructed in very different conditions, was unlikely to succeed. Italy's postwar ideological heritage was not statist social democracy or neo-liberalism but varieties of Christian democracy and Communism. The lack of ideological principle or a clear sense of political identity seemed to be the main consequence of the third way's passage to Italy. Moreover, there was no serious commitment to long-term structural reforms. This was most graphically illustrated by the protracted and ultimately failed attempt by Massimo D'Alema to instigate long-term constitutional reform that would prevent the possibility of Silvio Berlusconi being elected as Prime Minister. During 1997-98, D'Alema spent hours with Berlusconi in the bicameral commission discussing proposals for institutional reform. Implicit in the initial negotiations was D'Alema's decision not to pursue the question of Berlusconi's ever-present conflicts of interest. D'Alema's overall objective was to further transform the party system, in the spirit of the changes to the electoral set-up in 1993 that established a 'first past the post' system with a proportional component, in order to create a majoritarian politics favouring two main parties. This would mean isolating the left around Rifondazione and helping to facilitate a mainstream 'normal' right, around Forza Italia, excluding post-Fascists and the Northern League. Establishing this political reform was as crucial to D'Alema's idea of a 'normal country' as economic modernisation. Yet, as Ginsborg records, these negotiations fell apart after Berlusconi refused to cooperate in the later stages of discussions. This meant that not only did a key aspect of D'Alema's plan collapse, but Berlusconi was also allowed to continue unhindered, in fact given greater legitimation, in an unprecedented way, in his combined role as a major media baron and politician. The attempt to create a 'third way', as the Italian centre-left's route to a 'normal country', in the vision of D'Alema and Veltroni, depended to a large degree on the revision of Italy's historical memory. Yet the memory of the Resistance and the role of Communists in it had sustained the fortunes of the left in the postwar period and continued to deliver it prestige. Moreover, while the DS claimed a new modern role for itself after 1989, an assessment of its membership (a quarter of that of the PCI at the time of its dissolution) or its electoral performance (considerably lower than previous PCI performances) does not suggest a vibrant modern face of the left. Nor was the DS making inroads into the new generation. Its membership was significantly older than the PCI, and younger activists were shifting towards the more 'idealist' movements and Rifondazione comunista. In fact, from the evidence available of voting statistics, membership profiles and social composition, no convincing argument can be made to suggest that the DS is a new modernised party with a clear political identity. Indeed, when an analysis is made of the wider cultural and political legacy of the PCI, those movements and associations that imbibed left-wing culture and still exist - the CGIL and ARCI, for example, continue to prosper. Both have succeeded in sustaining a left-wing identity in non-p arty forms. ARCI, a cultural and political association set up in 1957 by the PCI but independent since the party's dissolution, has 1 million members in Italy and has doubled its membership since the end of Communism. It encompasses a whole range of alternative societies and recreational activities as well as political events, campaigns and legal advice for underprivileged groups. It has been instrumental in organising support for asylum seekers and migrants, while its pacifist outlook helped organise opposition to war. Its Arcigay network is the biggest gay rights movement in Italy, campaigning regularly on issues of equality and opposing discrimination, while Arciturismo has generated alternative tourism. ARCI's local presence in small towns as well as big cities has helped maintain an infrastructure and culture that has consolidated its left-wing identity. The CGIL, Italy's largest trade union federation, also remains an important part of Italian left-wing culture. Italy's trade unions are founded on political as well as occupational status and thus historically have reflected the Catholic-Communist divide. The CISL, the Catholic union federation, and UIL, a liberal centrist federation, provided rival union bodies. The passing of the PCI had implications for the membership of the CGIL, yet it subsequently continued to occupy an important left-wing role. The extent of this role in the politics of the left, as the CGIL's involvement in the movement against labour reform and the Iraq war took shape, resulting in the rapid rise of Sergio Cofferati (its secretary) as the unofficial leader of the left, is discussed in the next chapter. Significantly, the political identity of the CGIL has allowed it to take a broader view than is the case in other countries where trade union activities are often limited to industrial bargaining. Rifondazione comunista, together with a range of social centres, peace groups and the emerging anti-capitalist movement, has ensured that alternative sources of left-wing identity have remained despite the modernisation of the DS. Moreover, while the DS has been shaped by the quarentenni, its overall ageing membership has never recruited strongly among the ventenni ('twenty-somethings'). In this respect the late 1970s, a period in which young idealists chose to join social movements rather than political parties, has been mirrored by the contemporary left. In Italy, the movements of the 1970s were as significant in their own way as the late 1960s were in France. Links have been drawn between this movement and the anti-globalisation movement, the focus of the next chapter. It is certainly true that the abandonment of a Communist identity was crucial to the formation of the Olive Tree. The alliance between the DS and Christian Democrats opened up a new electoral opportunity to bring the left out of opposition. Yet the political basis for an alliance with the Christian Democrats remained weak and always a matter of delicate adjustment. While some critics have seen some continuity between Berlinguer's earlier strategy and that of the DS, this argument has been unconvincing. Even attempts to revive the ideas of Carlo Rosselli, an earlier representative of a vibrant left-liberal culture in Italy, or revisionist interpretations of Antonio Gramsci, have been unable to provide a convincing argument that a new political identity was being developed. The constant negotiations and disputes between centre-left leaders prevented any impression that a new politics was being created. D'Alema's reluctance to persevere with the reforming zeal that drove the 'Clean Hands' investigations meant that it was hard to convince the public of the validity of a new political project. The squabbling and wrangles rather confirmed that the old party politics was alive and kicking. Indeed, in this respect the Italian third way seemed to share some of the features that have evolved from the third way internationally, as it took on practical political significance. These were the new powers to party managers, a preference for pragmatic managerialism rather than ideological principle, a reduced role for intellectuals, and little time for 'movements', dissent or party activism, lest they disrupt the 'responsibilities of government'. This timidity in regard to ideological principle was apparent during the general election of 2001. Francesco Rutelli, formerly mayor of Rome, a role for which he was much respected, was put forward as the Ulivo candidate, chosen ahead of Giuliano Amato, the outgoing Ulivo Prime Minister and a socialist. Rutelli, chosen for his good looks and Blairite image, was also promoted by Veltroni. A member of the centrist Margherita ('Daisy') party of reformist Christian Democrats, though previously a member of the Greens, he was thought to be a charismatic and telegenic figure whose personal appeal would match that of Berlusconi. Moreover, he had no Communist skeletons in his cupboard, a point noted with relief by a centre-left intent on fighting the election on small-scale policy areas. In the event, the election was won partly by the stronger of two personalities, and in reality these individuals also represented different conceptions of politics. The pragmatism of Rutelli was no match for the populism of Berlusconi. The problem with the Italian third way lay in its project of making Italy a 'normal country'. Its way of doing this depended on searching for a political identity that was remote from its traditions and historical origins, the ideals of its membership, and the political culture - including the electoral system - it inhabited. In Britain, for example, the third way was created on the ashes of Thatcherism, the decline of the left, the absence of strong social movements, internal conflicts within the Labour Party and the vagaries of an electoral system that favoured only two main parties. In Italy, a country with strong movements, ideological politics, and respect for intellectuals, such an idea was never likely to take hold. Events since 2001 confirmed the impression that the third way and the political trajectory of the DS remained an issue of contention. The leaders of the centre-left, increasingly concerned with constructing unity of purpose, faced new challenges. One part of this was the shifts at international level that meant fewer allies were in government. Of those that remained, the longevity of Britain's Prime Minister was achieved without any strengthening of fortunes for the European centre-left as a whole. Blair's alliance with Silvio Berlusconi and Jose Aznar of Spain on flexible labour markets, and more significantly the coalition constructed with George Bush over the invasion of Iraq, put paid to existing unity. The split between the Labour Party and centre-left European allies also marked the demise of the third way itself, an idea that was already struggling to establish any coherence. The demise of the third way, however, did not prevent the Italian centre-left seeking further attempts at 'normalisation' as it began its preparations for the next election, due in 2006. With Romano Prodi's emergence as the only credible leadership candidate to take on Berlusconi, following his release as President of the European Commission in 2004, his first declaration was to call for a united party (of ex-Communists, Catholics and the rest) on the model of the British Labour Party. Differences within the Olive Tree prevented this scenario, and the party settled on a 'Prodi list', with a view to a federation. Yet the debates about how it should position its politics - for example, closer to the 'centre' ground, or to social movements - suggested its crisis of identity was no closer to being resolved. Nor was this made any clearer by further changes of name; initially to GAD (Grande alleanza democratica), Alleanza, or L'Unione, the name it decided on in early 2005. However, by then the parties faced challenges from their own constituencies, following the rapid emergence of a range of oppositional movements and associations, less inclined to be constrained by party allegiance and growing in confidence in the aftermath of Genoa and the opposition to the Iraq war. Politics was being remade outside political parties. ​"With these leaders we will never win"
Moretti's intervention proved to be highly significant. The immediate response was hostile. Massimo D'Alema walked off the platform in disgust, while Francesco Rutelli denounced the 'rantings of an artist'. Yet Moretti would be taken seriously, both in the media attention he was to get and in the future political direction of the DS, which attempted an internal debate over its political identity, future strategy and organisational structure, to which it invited intellectuals critical of its position. Moretti became the most important of these intellectuals and brought a new dimension to politics through the girotondi movement, at the same time opening another line of critique of the Berlusconi government. This movement started to hold regular rallies and events, focusing on Berlusconi's conflicts of interest and the dangers for Italian democracy therein. In an extraordinarily poignant way, Moretti's arrival on the political scene saw him address the same questions of political identity, citizen participation and the crisis of the left that had occupied many of his films. These works ranged from Palombella Rossa, the account of a PCI leader's crisis of political identity, to La Cosa (The Thing), a documentary about the dilemmas, contradictions and tribulations of the transition of the PCI into the PDS through the view of grassroots activists, to Aprile, which covered the election of the first Berlusconi government and the ineffectual opposition from the centre-left as well as the early stages of the uninspiring centre-left Ulivo government. In all of them Moretti used humour to depict the predicaments of the political class, while the leading characters, often played by himself, were humble, amateurish dissidents, not normally given to engaged political activity - not unlike, in fact, the girotondini, who from mid 2002 would fill Italian piazzas in their thousands. The irony here, as Mazierska and Rascaroli have argued, is that Moretti in a very short space of time moved from being a despairing and helpless observer of the Berlusconi phenomenon (his real-life despair and helplessness depicted in his film characters) to being 'perhaps unintentionally, a recognised leader of the popular movement of dissent against it'. Moreover, his entry into politics was a departure from the traditional role mass parties like the PCI attributed to intellectuals. In the past intellectuals were integrated into the structures of the party, often expected to defer to its cultural and organisational procedures and to offer uncompromising loyalty to its leadership. Now Moretti changed all the rules of intellectual engagement. The postmodern intellectual had more autonomy and was relatively detached from the norms of conventional politics, less constrained by ideological traditions and more free to negotiate, reflect and mediate between political movements. Aprile also covers the period of the first Olive Tree government. This first victory for the left cannot inspire the Moretti character though, as it failed to inspire many of its own supporters. In some cases, such as the sinking of a ship carrying Albanian immigrants trying to reach the coast of Brindisi, Moretti shows his despair at the indifference of the leaders of the Olive Tree to a contemporary tale of human suffering. to be indignant in the face of an anti-democratic attack on the magistrates like the one led by Berlusconi, of delirious attempts to dismember the Republic, such as the one carried out by Umberto Bossi's Northern League, but also in the face of the absence of the leaders of the left from the beach of Brindisi; it means not to be 'one of those who believes people are weIl, that capitalism is a society that has proved to be able to solve its own contradictions'; it means to be prepared to retell and redescribe the history of one's own community with cruel irony; it means to demystify ideology and authority in all its forms, including one's own; it means to be able to react, to say something, it does not matter if it is left wing, something civilised is enough. In short it means a great number of discourses that the left is failing to seize and organise into the new socialist project. 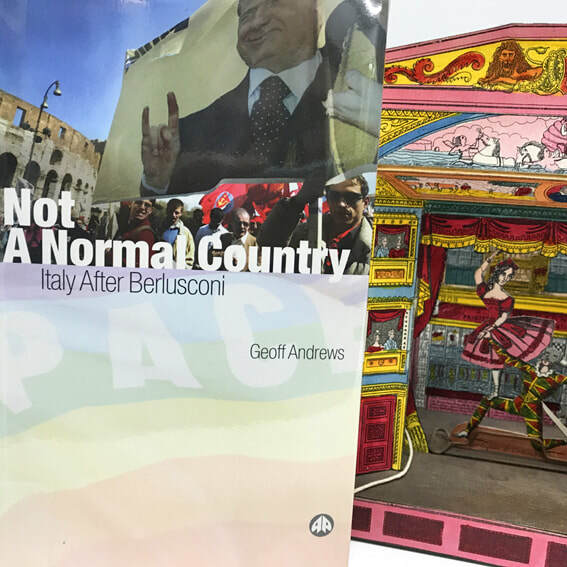 Moretti's postmodern idea of politics is distinct from the third way in that it envisages an expanded sphere of politics, one that is a fluid and contested realm, open to reinvention and shaped by artists, intellectuals and movements, not solely professional politicians. The key failure in the battle against Berlusconi was an inability to defend liberal institutions and the democratic basis of public life. It was a failure to challenge Berlusconi on his own terms. Moretti was the first person to do this effectively. Like Berlusconi, he was an 'outsider'; a 'humble intellectual', not a professional politician but one who understood the modern world, including the media. Like Berlusconi, he stood as a critic of the bureaucracy and aloofness of traditional political parties as well as their outmoded politics and language. For Moretti, though, it had been the movements, not the leaders the conscience of the liberal and democratic left, not the third way - ideas and visions, not pragmatism, bureaucracy and think tanks that inspired this revival. For Moretti was not a populist, but a popular intellectual who was able to stimulate a form of political association that breathed life into Italy's body politic on issues requiring urgent response, in a manner that was beyond the imagination of political parties.